TORY RICHARDS: Goddess Fish Promotions Celebrate Ten Years! 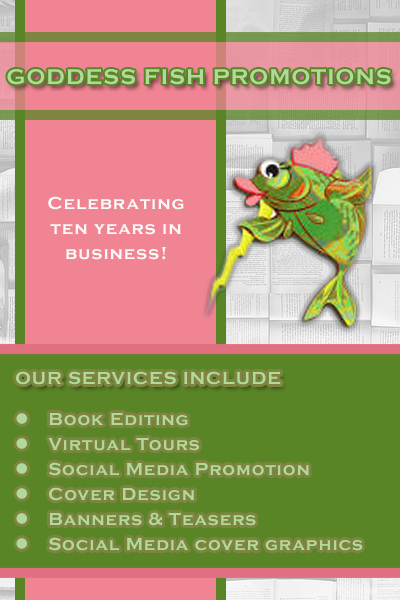 Goddess Fish Promotions Celebrate Ten Years! This blog has directed me to some awesome find of books my family absolutely love. Thank you so much! Happy Anniversary to Goddess Fish Promotions! Any time Goddess Fish! Happy Anniversary! Hi James, thanks for coming by and joining in the celebration. Thanks for stopping in Christine! Ha, I love the people behind Goddess Fish Promotions. Those poems were awesome! Hi Heather, thanks for stopping in! Congratulations on your milestone, those double digits. May the next decade be a wonderful one for Goddess Fish!